Iowa swimmer Chris Dawson set a school record in the 400-meter individual medley at the Big Ten Championships earlier this year. Thomas Rathbun, likewise, left his name etched in the Hawkeye annals as a UI record-holder in the 800 freestyle relay. Now with their successful college careers behind them, the two graduating seniors are testing new waters together: the small business world. Dawson, an English and cinema double major, and Rathbun, a geoscience major, launched a new outdoor clothing company called Trailheads Apparel that combines their love of nature with their sense of entrepreneurship. 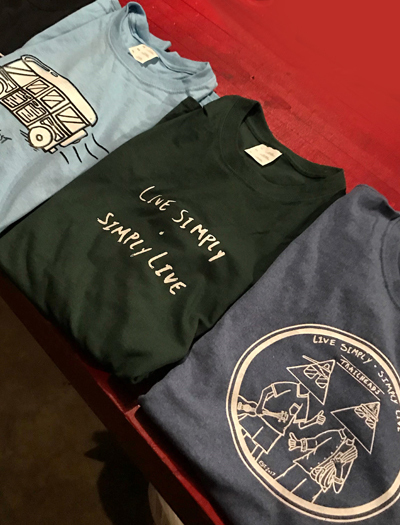 In the basement of Rathbun's Iowa City house, the duo runs a small screen-printing business that cranks out T-shirts and sweatshirts featuring hand-drawn designs by Dawson and witty slogans like "Camping? It's In-Tents." The student-athletes launched their company last year with a GoFundMe campaign that netted $2,000 to buy printing equipment and materials. They've since built an online storefront (trailheadsapparel.com) and added about two dozen designs to their product line. They hope to parlay the experience into a retail shop or larger screen-printing operation after graduation this month. RATHBUN: I had a few ideas for different T-shirt designs, but I have no artistic ability whatsoever. So I came to swim practice one day and said, "Hey, Chris, can you do a couple of mockups for these ideas?" We decided to not just make a couple for ourselves, but to try to sell them. DAWSON: Growing up I fell in love with Peanuts and Calvin and Hobbes, and I've been drawing ever since I could hold a pencil. The goal is to make stuff we'd enjoy wearing and that's hopefully applicable to other people. It's a lot of trial and error to find something that's funny and has a cool design. RATHBUN: Hiking, rock climbing, sailing, scuba diving—the outdoors is where I feel most comfortable. Last summer we went to Colorado with a few other guys on the team and hiked some fourteeners. DAWSON: I grew up in Colorado hiking, camping, and skiing. I spent a lot of time up in the mountains, but my family also visited the ocean every year. You donate 15 percent of your sales to the Red Cross disaster relief; why is that important for you? RATHBUN: This isn't something we're in to get rich. We want to work for ourselves and do something important to us, but also give back. DAWSON: There are so many shirt companies out there, but the motivation behind ours is very personal to us—encouraging people to get outdoors while helping others.